I love garnishing. It adds flavor and presentation to any dish. But garnishing like cilantro or scallions can be quite delicate to cut with a knife. I’m useless with a knife. Personally I find using a small pair of scissors to cut them so much easier. 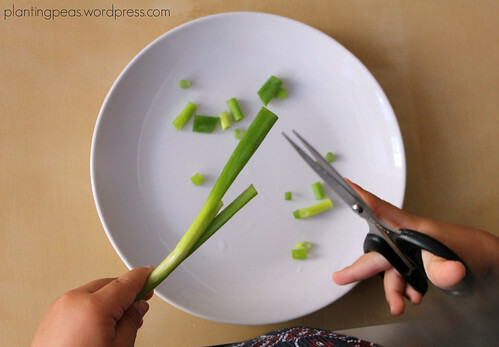 So when I introduced cooking to Z last week, I thought it would be easier for him to use a pair of scissors too. I love this really pointy pair of scissors that my mother-in-law gave us. 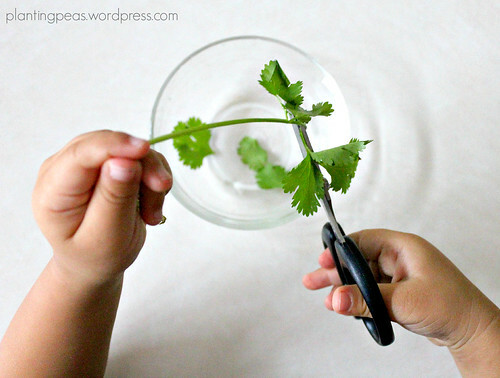 It helps us to aim right at the stem of the cilantro. Needless to say, it was quite an easy task for Z to accomplish, so he didn’t mind adding them to his lunch. Now did he actually eat them? No, he still spat them back out. 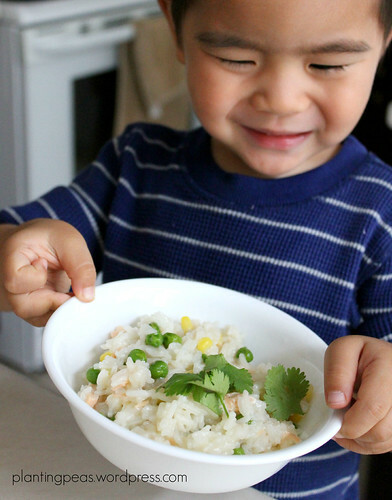 But still … I think garnishing like scallions or cilantro are healthy, so why not use a Montessori principle — make the dish so pretty that it will be a regular invitation for them to keep trying. After all, our taste palettes change with time. I know mine did, because I used to hate cilantro and scallions too.